Iron which contains little or no carbon is called Ferrite. This is a soft and ductile phase and is known as alpha iron generally by metallurgists. Ferrite is the name given to pure iron crystals. 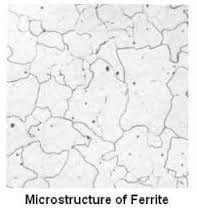 Ferrite is present to some extent in a great range of steels, particularly those low in carbon content, and it is also present, in soft cast iron. Ferrite has the following mechanical properties: Its KCU = 2.5 MJ/m2 , and HB = 80-100. Below the critical temperature, the slow cooling of low carbon steel produces ferrite structure. Ferrite is very soft and highly magnetic and does not harden when cooled rapidly. It forms smaller crystals when cooled from a bright red heat at a rapid rate.